You can lose weight without cutting calories. This statement is partially true, but if you fail to lose weight or have some stubborn pounds you can lose, you should stop and reevaluate your caloric intake. Your body needs a certain baseline level of calories. I cannot count the number of people that think that weight loss is just a simple mathematical equation. I am not saying that calories do not matter and I am not saying that you do not need to create a negative calorie balance to lose weight, but weight loss is not as simple as burn more than you eat and eat less food to lose weight. The number of calories your body needs changes over time. The majority of the calories you burn changes very little from day to day. 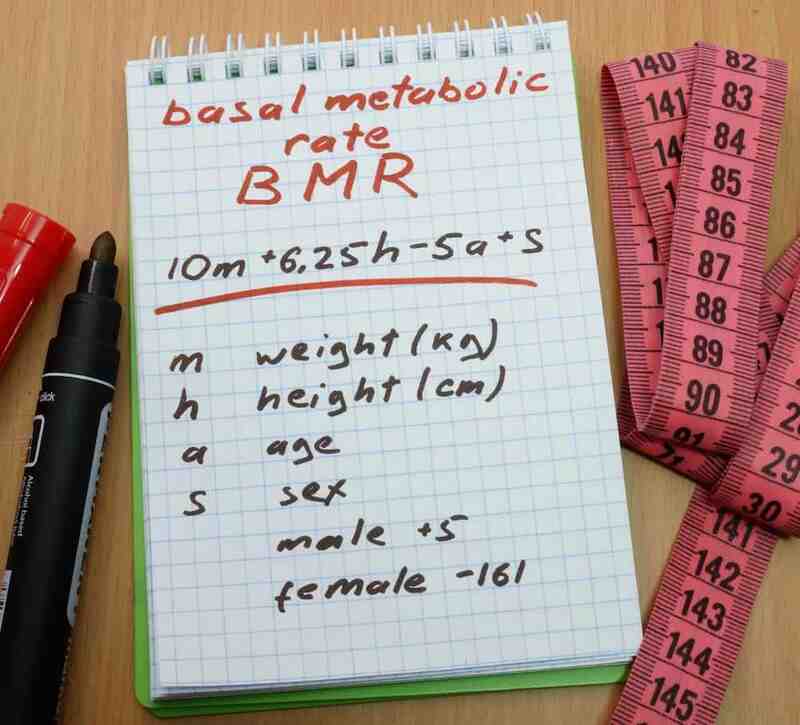 Basal Metabolic Rate or BMR (see image to the right) is the number of calories you need to maintain your body in its current state without activity. Your total requirement for calories depends on your daily activity and your BMR. As we age, we lose muscle and our BMR drops. If we become more active, we will gain more muscle and slow the age-related loss of muscle. If you do not get enough, your body will go into a starvation mode of catabolism. Catabolism occurs when you burn sugar, fat, and muscle to produce energy. If you do not get enough calories, you will burn muscle at a higher rate, and your metabolic rate will drop. Because BMR does change, you should reassess your caloric requirement whenever your weight loss or maintenance stagnates. perform the maintenance on your body as required. If you are losing too slow, maybe the level is too high. Since this level changes with weight loss, reestimation might be warranted periodically. If you stick to 1-2 pounds lost per week, you will be less likely to stagnate or lose more muscle mass. Should I calculate my BMR? I do not find BMR to a be a helpful number when I am dieting. I find that it is more helpful for me to measure my total calorie estimate. You can use the calculator above to get that number. If you stagnate, stop by and use the calculator again. Can I increase my metabolic rate? Yes. Exercise will increase your caloric burn during exercise and rest. I recommend a mixture of resistance training and aerobic exercise. It will help you burn calories and build muscle. More muscle will lead to more calories burned and a higher metabolic rate. The bottom line: You can lose weight without cutting calories, but it is difficult. It is a good idea to use a mixture of diet and exercise to lose weight. Be the first to comment on "Myth: You have to cut calories to lose weight"